Shopping online is aaahmazing, right? You can find products, compare prices and search for deals soooo easily. BUT it can be nerve-wracking pressing “Buy” when you don’t really know who you’re buying from. So I thought I’d put together a page sharing all the testimonials that get emailed to me. You can also check out my Facebook Reviews or Google Reviews too. In an Instagram post, TV personalities Colin and Justin write about adding their custom logo over brick wallpaper I supplied for a Cityline television segment. Click on the photo to read their kind words. Ohhhhhhh I have to tell you that my mural looks INCREDIBLE! Thank you Adrienne. I love love love love it!! !I am thrilled with the quality of the mural and how it makes my room something seriously special! I can’t wait to show it off! I used it as a backdrop for a photo today and it looks just gorgeous! thank you!! My baby boy nursery room looks amazing. I strongly recommend Adrienne work to anyone. She is coming back to add more to our house too. Excellent Job! Beautiful birch tree mural! It makes the room look so special. Adrienne was very kind and helpful. We love everything about our mural! Kids love it!!! Molly is not crying in the one photo, she was growling, she was a wolf and we were the piggies hahahah!! My husband and I are renovating an old cottage. We ordered a mural on line from aboutmurals.ca. Our order was shipped very quickly to us. Our wallpaper came with crayons to hide white edges, I misplaced these and Adrienne sent me a replacement quickly with no hassle or bother. Very easy to deal with. Neither of us have really hung wall paper before and we were a little nervous when we started. We primed our wall with the recommended primer and began the process. The instructions were very clear and easy. It did not take us long to get into the swing of things and the wallpaper was hung in no time. Our wall was not square, we figured out how to get the first strip straight and after that, the wallpaper went on smooth and easy. I was amazed at how easy it was. We are in love with the final outcome of our project and would highly recommend Aboutmurals to everyone. Tyler loved his surprise birthday present…and so did all the guests! Thank you for helping me pick out a mural he’d love. Thought I’d send some pictures of the mural in our bathroom. We hung the mural this weekend with little trouble. It’s gorgeous and my son really loves pointing out everything he can identify (he’s 2 1/2). Believe it or not, I saw this mural in the kid’s corner of my dentist’s waiting room and was amazed by the quality of the paper and the images. I searched for it online and came upon your store and a couple of others. You had the best price, given your promotion. Thanks for your interest and for your quick shipping of the product. When designing my daughter’s nursery I decided to use her bedding as the theme. Adrienne’s work exceeded my expectations. Her free hand drawings and then painting the Jungle theme were exactly, if not even more incredible, than the actual bedding! From a newborn until now, my daughter still touches the animals on the wall and absolutely protests changing her room. Even 5 years later she still loves the theme and will not allow us to change it! Most nights we still hear her talking to the monkey on the wall. It’s very sweet! It was well worth the money to be still enjoying the beautiful hand drawn murals so many years later! My husband and I wanted to do something special for our son in his playroom. We had an idea of what we wanted, but couldn’t quite put our finger on what we wanted the details to look like. We got some quotes from people in our area (London), as well as a quote from Adrienne with About Murals out of the Hamilton area. Although her quote was slightly higher due to travel time and costs to get to us, we really loved her work and are so glad that we chose to go with her. She was a pleasure to work with through the planning process and gave excellent ideas for what the mural could look like. She arrived when she said she would, and stayed until it was completed. We are so pleased with the final product. Not only did it look great when she was finished, but a week later we received a surprise “Thank You” gift in the mail, which was a special little touch to the mural – my son’s name in vinyl that we added to the tractor in the mural. We would highly recommend Adrienne, and will be using her again in the future ourselves. Adrienne from About Murals recently painted a Montreal Canadiens logo on the wall in my son’s bedroom. She went above and beyond with meticulous accuracy in order to ensure a fantastic job. We all think it looks great! So much in fact, we have Adrienne returning for other painting projects. About Murals brings ideas and characters to life! 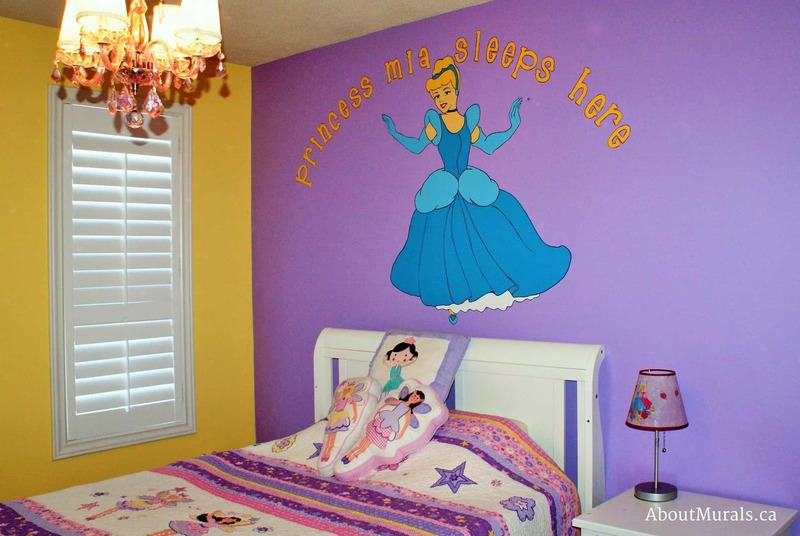 Adrienne brought Cinderella to life in my daughter, Mia’s, bedroom, painting a mural that will be with her forever. Minnie Mouse entered the nursery on wooden letters that will engage my baby and encourage Alessandra to learn her looooong name!